So, Is it Wrong to Try to Pick Up Girls in a Dungeon or Not? It was a simple question—”Is it wrong to try to pick up girls in a dungeon?” But simple questions don’t always have correspondingly simple answers, and so it is with Is it Wrong to Try to Pick Up Girls in a Dungeon?‘s ridiculous titular query. And why? Because Danmachi, in specifically calling attention to the issue of how one ought to interact with girls met in a dungeon, actually intiates a strange sort of dialogue with the question. Now, really, watching Danmachi for the answer to the question of whether or not it is morally permissible to attempt to hit on and/or physically pick up girls while traversing the depths of a monster-filled dungeon isn’t necessarily the way I’d suggest watching it, but it does provide an interesting lens with which to view the way the show. The curious thing about the lessons Bell has absorbed from his grandfather (later revealed to be his father, the womanizing Greek God Zeus) is that he is, at this point in his life, utterly unable to put them into practice. From the opening moments of the first episode, we are given to understand that Bell is weak. He is not the image of the hero he desires to be, nor is he emotionally mature enough to “play it cool” and take advantage of the female affections that come his way. To this point, Bell’s cutesy character design and childlike demeanor/desire to get stronger (aka, “grow up”) play a big role in legitimizing the way Bell reacts to the women in his life as something true about his character, rather than being a typical light novel-induced response. I mean, it is that, but it actually has a point here. Where this leaves Bell, unable to follow through with Zeus’ creepy cajoling, is with no other option than to engage the second position while he attempts to achieve the first. However, he continually runs up into the reality of his world, which is—girls don’t need him to save them and, when they do, it’s not because they’re girls. This point is articulated again and again and again throughout the show, whether it’s through Aiz, Lili, or Hestia. 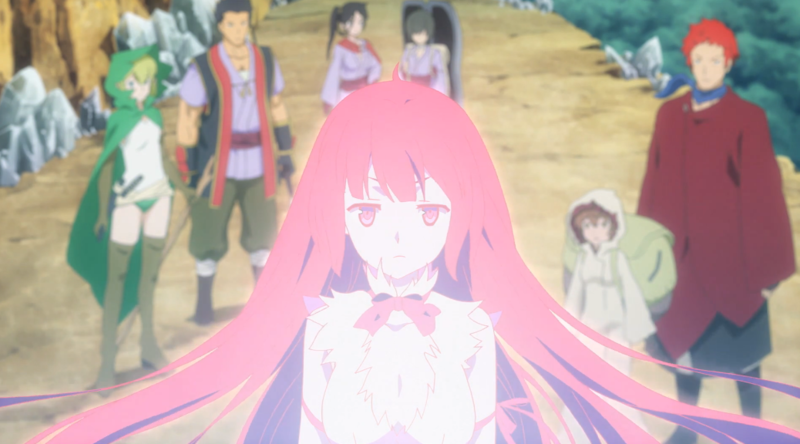 Of these, Hestia is the most influential and prominent, mostly because she is the character who most closely adheres to the mutually supportive construction of male-female relationships Danmachi posits as the counterpoint to “Rrrrrrrrrrrrrrrromance!” Despite being a disempowered goddess, Hestia consistently resists the “damsel in distress” and “oh, won’t a boy please help me!” molds—and when she does, it’s not necessarily Bell who saves her (as when Lili frees her from the kidnappers in the series finale). Rather, Hestia is constantly taking action to support Bell herself, even sometimes being the one who is the savior of Bell, rather than the other way around. But, more importantly, Hestia is Bell’s familia, his family. And, in families, you don’t help each other because one’s a girl or one’s a boy. You do it because that’s what families do. Beyond that, Hestia is the faciliatator of Bell’s growth, the divine being who allows Bell to have the strength to grow and to save. And she’s a girl! And it doesn’t matter! For their own parts, Aiz and Lili make strong statements against being simple dungeon trophies for Bell to win. Aiz is incomparably strong, the furthest thing from a girl who needs saving—in fact, she’s this so much so that she’s actually the ideal that Bell is chasing. That’s right; Bell is chasing a woman to become a man who can save women. The irony is obvious and rich. Furthermore, Aiz saves Bell from certain death multiple times, reversing the entire paradigm of “boy saves girl, girl falls in love with boy” to “girl saves boy, boy falls in love with girl.” And for Lili, although she’s physically and emotionally beaten up, she tosses away Bell’s initially stated reason for saving her—”Because you’re a girl?” he says—forcing him to arrive at the far more poignant conclusion: “Because you’re you.” Now, although this is a Cliche Anime Line in the extreme, as a rejection of a gendered reason for saving, it’s powerful and meaningful and moving—and, best of all, it reinforces the theme of support (“saving”) for the sake of the person, rather than their gender. All of this is really just to say that Danmachi, although it showers Bell with the affections of numerous female characters, does so in an oddly healthy way. While certain side characters (some of them don’t even have names) fall for his heroic deeds, the most prominent female figures in his life interact with him on equal terms—even if he possesses more fighting power. Hestia’s affections for Bell (romantic or familial) aren’t motivated out of anything Bell did. It’s because he’s Bell, and she loves him. Likewise, Lili’s affections for Bell come not from the function of him “saving” her, but rather from the fact that he accepted her despite her flaws. And Aiz’s attraction towards Bell seems a combination of fascination with his desire to become stronger, along with his boyish charms (which I admit I find pretty darn cute, too). In the end, all of this is really just to say that, for now, I think the answer Is it Wrong to Try to Pick Up Girls in a Dungeon? isn’t yes and it isn’t no. Rather, it simply suggests that, while yes, you can possibly pick up girls in a dungeon, there are far better ways to relate with them. Of course, much of this is at odds with the way Danmachi clothes its female characters and with the way the camera chooses to focus on their bodies, but the dynamics of these relationships offer a fascinating alternative to the standard shonen anime tracks of male-female relationships. 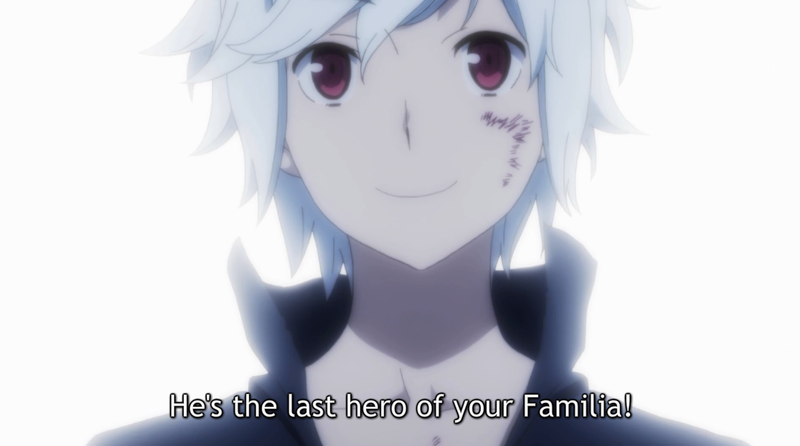 By setting up the ideal of the heroic man who wins the affections of the ladies and simultaneously placing it out of the male protagonist’s reach through both his weakness and the strength of the women around him, Danmachi forces an acknowledgement of other options. 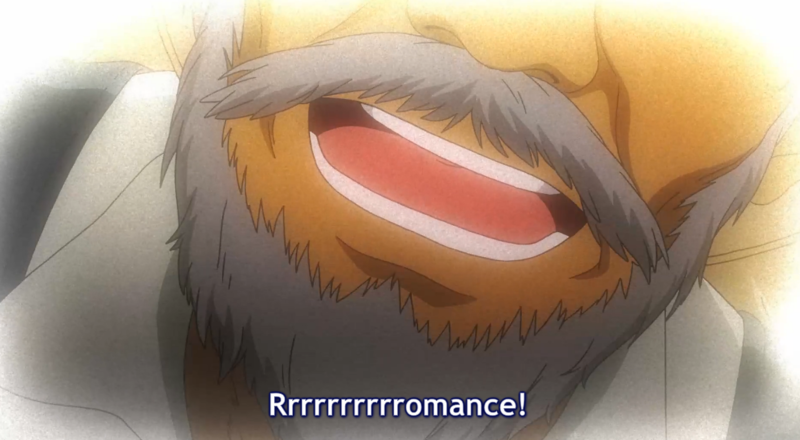 In short, don’t try to pick up girls in a dungeon. Instead, try treating her like the capable person she is. You might be surprised at how much she can do. This post was originally published under the same title on Crunchyroll as part of the Aniwords column. The original post can be found here. Aniwords, Reviews & ReflectionsAniwords, Danmachi, Gender Politics, Is it Wrong to Try to Pick Up Girls in a Dungeon? As a woman, I’m going to go ahead and say, yes, it’s ok to pick up girls in a dungeon. Provided you’re not getting distracted and getting anyone killed. Did Hestia and Bell eventually become a romantic item? I was under the impression that Hestia is lusting all over the dense Bell (*solely based on reading Ep 1 preview way back when, natch), but what you’re describing sounds like a much more interesting dynamic. I really like the idea of a male and female lead having a meaningful relationship that goes beyond the usual romantic trappings, esp. in a shonen fantasy, which tends to have shallow romance rooted in gender stereotypes. Reminds me of One Piece, the strongest example in the genre IMO in portraying a deeply rooted sense of familial bond and camaraderie between its main characters (really like Luffy and Nami as the male and female leads respectively). (incidentally, I kind of wonder why One Piece isn’t more popular among the younger anime fans/outside shonen fans, but I’m guessing the gigantic episode count serves as a significant entry barrier for people who don’t literally watch it since childhood like myself). Insane episode count, general lack of US TV exposure compared to Naruto & Bleach, the unusual art style compared to typical shounen…those things are all potential barriers. Having said that, pretty much all of the teens in my anime club at least know a little bit about One Piece, and a couple of them actually have watched all 680+ episodes (ah, to be young and have free time again!). Finally finished DanMachi and it’s so good! It is heartwarming, and it is fun. – The dynamics between Bell and his companions, including those that are not his immediate party members. – Acceptance of flaws, such as both the cases of Lili and Ryu. – Subtle romances, although not as much screen time, Ouka and Chigusa. These little details give me much joy. 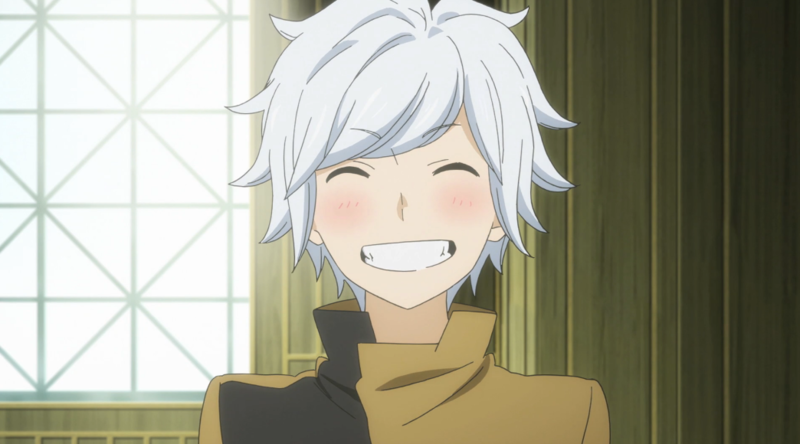 And then I realized, I just love a loooooooot more things about DanMachi. It’s really warm and cozy.